Yes, this is the onset of Gaspee Days in Warwick, Rhode Island. While enjoying the long weekend courtesy of Memorial Day, many of us will spend a day down in Pawtuxet Village at the Gaspee Days Arts and Crafts Festival. Then, hopefully after a successful day of browsing and shopping, we'll return to our backyards and decks to fire up the BBQ. Let the summer begin. 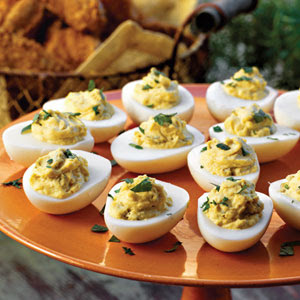 Spicy Southwestern Deviled Eggs a crowd-pleaser! 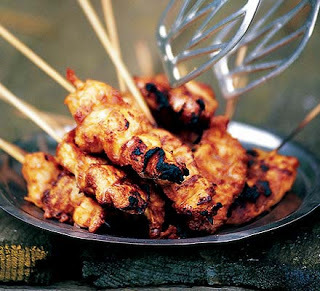 Try preparing these skewers of Chicken Satay early so they can go on the grill as you need them. We love burgers at my house so we'll be grilling classic favorites with spicy new twists. 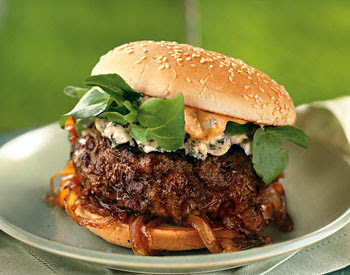 These Andouille and Beef Burgers are a mouthful of flavor. 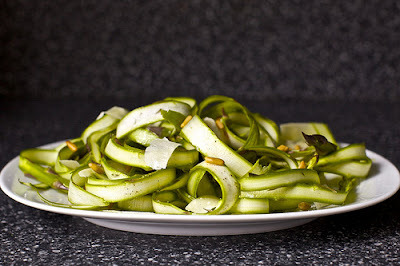 A fabulous sidedish I found packs great visual interest and a fresh surprise on an old classic. The Grilled Zucchini Salad is loaded with the texture of Romano cheese and pine nuts.